The first single from Acoustic was Promised You A Miracle . It was released to promote the album. 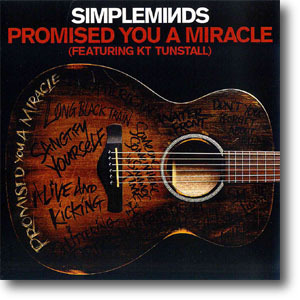 THe song was selected as not only was it their first "real" hit back in 1982 but fellow Scot K T Tunstall shared lead vocals and played guitar for this new acoustic version. It was only released officially as a download. Two promo versions of the single were also issued, both in glossy picture sleeves, and both only carrying a minimal number of tracks. These featured artwork based on Acoustic, but only with Promised You A Miracle hightlighted in yellow. The video was initially shot at Glasgow's Old Fruit Market with the whole band. Close-up inserts featuring K T Tunstall were edited in later. The single was announced as BBC Radio Two's Single Of The Week on the 15th October 2016.